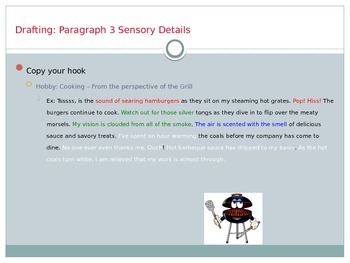 This step by step writing Power Point gives modeled directions and incorporates point-of-view in a fun writing activity that students will love! Students will get to write about their favorite hobby, but with a twist...from the perspective of an object that represents their hobby. For example, if you love to dance, you might write from the perspective of a ballet shoe or the floor on which you might dance! What would your ballet shoe say? What might the floor say if it could speak? Imagine if you were a soccer player! What might the ball say if it could speak? GOAL! I Zoom through the air as my player kicks me through the air! It's an amazing feeling being a soccer ball! 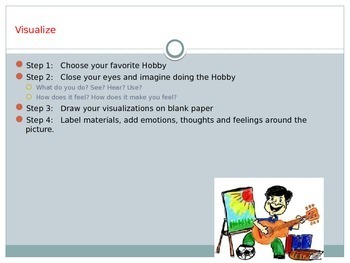 This activity guides students through point-of-view and also shows them several examples of how to incorporate elaborative details from the beginning to the end. Paragraph 5: Short Research - Where would I go to get additional information about this hobby? 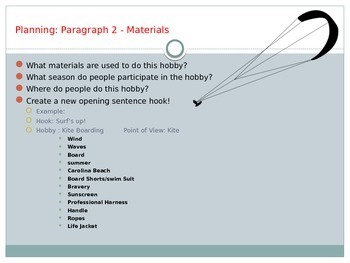 Power Point includes planning, drafting, and modeled writing slides! Aligned with common core curriculum for 3-6 grades! Up to 3 weeks of lessons! Additional directions provided for end of unit Hobby Fair!